The common milkweed along the roadsides and fence rows around Gridley played an important role during World War II. Originally, life preservers that the military used were filled with floss from the tropical kapok tree located in the Dutch East Indies. During World War II, the Japanese gained control of the Dutch East Indies, now called Indonesia. This action cut off the United States supply of floss. Milkweed became the substitute. The milkweed seeds have white, wispy hairs known as floss that are buoyant. Since it takes three years to produce a commercial crop, the government set up collection sites wherever the plant grew wild. Two bags of pods contained floss for one life jacket. In August of 1944, the Gridley Light reported that the common milkweed pods would be ready to be harvested by the middle of August. “Since mileage is an important item, it would be appreciated if farmers who have a lot of milk weed on their places notify County Agent J.W. Stockebrand at Burlington so pods can be gathered without doing so much driving.” The collection was sponsored by the 4-H clubs, Boy Scouts, Girl Scouts, and schools. 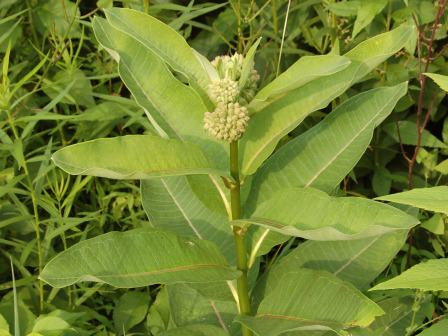 When you open the stem of a milkweed, you will find out very quickly why it acquired its name. It secretes a white, sticky substance that the plant uses to heal itself. The government in an unsuccessful attempt tried to use it to replace rubber since it has a latex quality. On Dobbin Place Southwest in Gridley, you are guaranteed to see milkweed in July. The milkweed is only one of many, many wildflowers that can be seen in the area from March to October in a myriad of colors. Two excellent websites for Kansas’ wildflowers are www.kswildflower.org and http://www2.pittstate.edu/herbarium/illustrated.html.